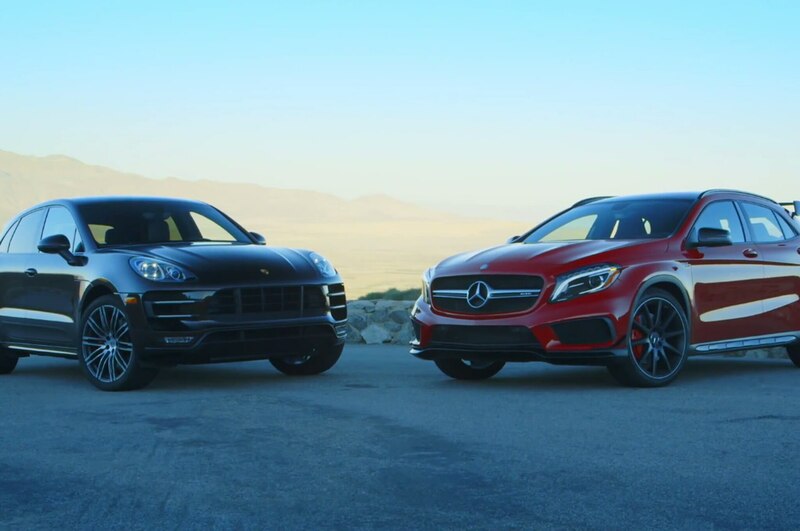 In the newest episode of Motor Trend’s Head 2 Head, host Jonny Lieberman pits the Porsche Macan Turbo against the equally-bonkers Mercedes-Benz GLA45 AMG, wringing them out down an idyllic California canyon road. While both crossovers are similar in approach, they differ when it comes to on-road performance and power. The Porsche Macan Turbo is the hottest version of the German crossover available right now, with 400 hp and 406 lb-ft of torque from a 3.6-liter twin-turbocharged V-6. The Mercedes-Benz GLA45 AMG, on the other hand, features a 2.0-liter turbocharged inline-four pumping out 355 hp and 332 lb-ft of torque. The Macan’s power advantage shows in the straight-line comparison, beating out the GLA45 to 60 mph by 0.2 second, at 4.6 seconds, but in other respects the GLA45 AMG proves its worth. As Lieberman discovers as he drives the two back-to-back, it is incorrect to approach these two terrors from a pure performance perspective. Instead, he focuses on which high-performance crossover delivers the most smiles, and provides the most giggle-filled experience. After providing background for each crossovers and putting in some quality seat time, Liberman sets up the two on a closed course in the canyon roads, allowing for the power-hungry Porsche Macan Turbo to strut its stuff next to the much lighter and more aggressive Mercedes-Benz GLA45 AMG. To find out who won in this turbocharged comparison, take a look at the video below.